"Coin-op" redirects here. For other coin-operated machines, see Vending machine. Not to be confused with Casino game. A player in Japan playing Police 911, an arcade game in which players use a light gun. An arcade game or coin-op game is a coin-operated entertainment machine typically installed in public businesses such as restaurants, bars and amusement arcades. Most arcade games are video games, pinball machines, electro-mechanical games, redemption games or merchandisers. While exact dates are debated, the golden age of arcade video games is usually defined as a period beginning sometime in the late 1970s and ending sometime in the mid-1980s. Excluding a brief resurgence in the early 1990s, the arcade industry subsequently declined in the Western hemisphere as competing home video game consoles such as the Sony PlayStation and Microsoft Xbox increased in their graphics and game-play capability and decreased in cost. The first popular "arcade games" included early amusement-park midway games such as shooting galleries, ball-toss games, and the earliest coin-operated machines, such as those that claimed to tell a person's fortune or that played mechanical music. The old Midways of 1920s-era amusement parks (such as Coney Island in New York) provided the inspiration and atmosphere for later arcade games. In the 1930s the first coin-operated pinball machines emerged. These early amusement machines differed from their later electronic cousins in that they were made of wood. They lacked plungers or lit-up bonus surfaces on the playing field, and used mechanical instead of electronic scoring-readouts. By around 1977 most pinball machines in production switched to using solid-state electronics both for operation and for scoring. In 1966 Sega introduced an electro-mechanical game called Periscope - an early submarine simulator and light gun shooter which used lights and plastic waves to simulate sinking ships from a submarine. It became an instant success in Japan, Europe, and North America, where it was the first arcade game to cost a quarter per play, which would remain the standard price for arcade games for many years to come. In 1967 Taito released an electro-mechanical arcade game of their own, Crown Soccer Special, a two-player sports game that simulated association football, using various electronic components, including electronic versions of pinball flippers. Sega later produced gun games which resemble first-person shooter video games, but which were in fact electro-mechanical games that used rear image projection in a manner similar to the ancient zoetrope to produce moving animations on a screen. The first of these, the light-gun game Duck Hunt, appeared in 1969; it featured animated moving targets on a screen, printed out the player's score on a ticket, and had volume-controllable sound-effects. That same year, Sega released an electro-mechanical arcade racing game, Grand Prix, which had a first-person view, electronic sound, a dashboard with a racing wheel and accelerator, and a forward-scrolling road projected on a screen. Another Sega 1969 release, Missile, a shooter and vehicle-combat simulation, featured electronic sound and a moving film strip to represent the targets on a projection screen. It was the earliest known arcade game to feature a joystick with a fire button, which formed part of an early dual-control scheme, where two directional buttons are used to move the player's tank and a two-way joystick is used to shoot and steer the missile onto oncoming planes displayed on the screen; when a plane is hit, an animated explosion appears on screen, accompanied by the sound of an explosion. In 1970 Midway released the game in North America as S.A.M.I.. In the same year, Sega released Jet Rocket, a combat flight-simulator featuring cockpit controls that could move the player aircraft around a landscape displayed on a screen and shoot missiles onto targets that explode when hit. In the course of the 1970s, following the release of Pong in 1972, electronic video-games gradually replaced electro-mechanical arcade games. In 1972, Sega released an electro-mechanical game called Killer Shark, a first-person light-gun shooter known for appearing in the 1975 film Jaws. In 1974, Nintendo released Wild Gunman, a light-gun shooter that used full-motion video-projection from 16 mm film to display live-action cowboy opponents on the screen. One of the last successful electro-mechanical arcade games was F-1, a racing game developed by Namco and distributed by Atari in 1976; this game appeared in the films Dawn of the Dead (1978) and Midnight Madness (1980), as did Sega's Jet Rocket in the latter film. The 1978 video game Space Invaders, however, dealt a yet more powerful blow to the popularity of electro-mechanical games. In 1971 students at Stanford University set up the Galaxy Game, a coin-operated version of the video game Spacewar. This ranks as the earliest known instance of a coin-operated video game. Later in the same year, Nolan Bushnell created the first mass-manufactured game, Computer Space, for Nutting Associates. In 1972, Atari was formed by Nolan Bushnell and Ted Dabney. Atari essentially created the coin-operated video game industry with the game Pong, the first successful electronic ping pong video game. Pong proved to be popular, but imitators helped keep Atari from dominating the fledgling coin-operated video game market. Taito's Space Invaders, in 1978, proved to be the first blockbuster arcade video game. Its success marked the beginning of the golden age of arcade video games. Video game arcades sprang up in shopping malls, and small "corner arcades" appeared in restaurants, grocery stores, bars and movie theaters all over the United States, Japan and other countries during the late 1970s and early 1980s. Space Invaders (1978), Galaxian (1979), Pac-Man (1980), Battlezone (1980), Defender (1980), and Bosconian (1981) were especially popular. By 1981, the arcade video game industry was worth US$8 billion ($22 billion in 2018). During the late 1970s and 1980s, chains such as Chuck E. Cheese's, Ground Round, Dave and Busters, ShowBiz Pizza Place and Gatti's Pizza combined the traditional restaurant or bar environment with arcades. By the late 1980s, the arcade video game craze was beginning to fade due to advances in home video game console technology. By 1991, US arcade video game revenues had fallen to $2.1 billion. Sega AM2's Hang-On, designed by Yu Suzuki and running on the Sega Space Harrier hardware, was the first of Sega's "Super Scaler" arcade system boards that allowed pseudo-3D sprite-scaling at high frame rates. The pseudo-3D sprite/tile scaling was handled in a similar manner to textures in later texture-mapped polygonal 3D games of the 1990s. Designed by Sega AM2's Yu Suzuki, he stated that his "designs were always 3D from the beginning. All the calculations in the system were 3D, even from Hang-On. I calculated the position, scale, and zoom rate in 3D and converted it backwards to 2D. So I was always thinking in 3D." It was controlled using a video game arcade cabinet resembling a motorbike, which the player moves with their body. This began the "Taikan" trend, the use of motion-controlled hydraulic arcade cabinets in many arcade games of the late 1980s, two decades before motion controls became popular on video game consoles. Arcades experienced a major resurgence with the 1991 release of Capcom's Street Fighter II, which popularized competitive fighting games and revived the arcade industry to a level of popularity not seen since the days of Pac-Man, setting off a renaissance for the arcade game industry in the early 1990s. Its success led to a wave of other popular games which mostly were in the fighting genre, such as Pit-Fighter (1990) by Atari, Mortal Kombat by Midway Games, Fatal Fury: King of Fighters (1992) by SNK, Virtua Fighter (1993) by Sega, Killer Instinct (1994) by Rare, Tekken (1994) by Namco, and The King of Fighters (1994–2005) by SNK. In 1993, Electronic Games noted that when "historians look back at the world of coin-op during the early 1990s, one of the defining highlights of the video game art form will undoubtedly focus on fighting/martial arts themes" which it described as "the backbone of the industry" at the time. 3D polygon graphics were popularized by the Sega Model 1 games Virtua Racing (1992) and Virtua Fighter (1993), followed by racing games like the Namco System 22 title Ridge Racer (1993) and Sega Model 2 title Daytona USA, and light gun shooters like Sega's Virtua Cop (1994) and Mesa Logic's Area 51 (1995), gaining considerable popularity in the arcades. By 1994, arcade games in the United States were generating revenues of $7 billion in quarters (equivalent to $11.8 billion in 2018), in comparison to home console game sales of $6 billion, with many of the best-selling home video games in the early 1990s often being arcade ports. Combined, total US arcade and console game revenues of $13 billion in 1994 ($22 billion in 2018) was nearly two and a half times the $5 billion revenue grossed by movies in the United States at the time. Around the mid-1990s, the fifth-generation home consoles, Sega Saturn, PlayStation, and Nintendo 64, began offering true 3D graphics, improved sound, and better 2D graphics, than the previous generation. By 1995, personal computers followed, with 3D accelerator cards. While arcade systems such as the Sega Model 3 remained considerably more advanced than home systems in the late 1990s, the technological advantage that arcade games had, in their ability to customize and use the latest graphics and sound chips, slowly began narrowing, and the convenience of home games eventually caused a decline in arcade gaming. Sega's sixth generation console, the Dreamcast, could produce 3D graphics comparable to the Sega NAOMI arcade system in 1998, after which Sega produced more powerful arcade systems such as the Sega NAOMI Multiboard and Sega Hikaru in 1999 and the Sega NAOMI 2 in 2000, before Sega eventually stopped manufacturing expensive proprietary arcade system boards, with their subsequent arcade boards being based on more affordable commercial console or PC components. Arcade video games had declined in popularity so much by the late 1990s, that revenues in the United States dropped to US$1.33 billion in 1999, and reached a low of $866 million in 2004. The gap in release dates and quality between console ports and the arcade games they were ported from dramatically narrowed, thus setting up home consoles as a major competitor with arcades. Furthermore, by the early 2000s, networked gaming via computers and then consoles across the Internet had also appeared, replacing the venue of head-to-head competition and social atmosphere once provided solely by arcades. The arcade market suffered from a lack of diversity even compared to other gaming markets (a 1996 survey showed that 70% of arcade players were teenage males), leading to a cycle in which the uniformity of the audience discouraged innovation in game design, which in turn further discouraged people outside the narrow target audience from visiting arcades. The arcades lost their status as the forefront of new game releases. Given the choice between playing a game at an arcade three or four times (perhaps 15 minutes of play for a typical arcade game), and renting, at about the same price, exactly the same game—for a video game console—the console became the preferred choice. Fighting games were the most attractive feature for arcades, since they offered the prospect of face-to-face competition and tournaments, which correspondingly led players to practice more (and spend more money in the arcade), but they could not support the business all by themselves. A 20th anniversary arcade machine, combining the two classic games Ms Pac-Man and Galaga. To remain viable, arcades added other elements to complement the video games such as redemption games, merchandiser games, and food service, typically snacks and fast food. Referred to as "fun centers" or "family fun centers", some of the longstanding chains such as Chuck E. Cheese's and Gatti's Pizza ("GattiTowns") also changed to this format. Many 1980s-era video game arcades have long since closed, and classic coin-operated games have become largely the province of dedicated gamers and hobbyists. In the 2010s, some movie theaters and family fun centers still have small arcades. In the 2000s and 2010s, arcades have found a niche market by providing games that use special controllers largely inaccessible to home users, such as dance games that have a floor that senses the user's dancing. An alternative interpretation[by whom?] (one that includes fighting games, which continue to thrive and require no special controller) is that the arcade is now a more socially-oriented hangout, with games that focus on an individual's performance, rather than the game's content, as the primary form of novelty. Examples of today's popular genres are rhythm games such as Dance Dance Revolution (1998) and DrumMania (1999), and rail shooters such as Virtua Cop (1994), Time Crisis (1995) and House of the Dead (1996). In the Western world, the arcade video game industry still exists, but in a greatly reduced form. Video arcade game hardware is often based on home game consoles to reduce development costs; there are video arcade versions of Dreamcast (NAOMI, Atomiswave), PlayStation 2 (System 246), Nintendo GameCube (Triforce), and Microsoft Xbox (Chihiro) home consoles and PC (e.g. Taito Type X). Some arcades have survived by expanding into ticket-based prize redemption and more physical games with no home console equivalent, such as skee ball and Whac-A-Mole. Some genres, particularly dancing and rhythm games (such as Konami's Dance Dance Revolution), continue to be popular in arcades. Worldwide, arcade game revenues gradually increased from US$1.8 billion in 1998 to US$3.2 billion in 2002, rivalling PC game sales of US$3.2 billion that same year. In particular, arcade video games are a thriving industry in China, where arcades are widespread across the country. The US market has also experienced a slight resurgence, with the number of video game arcades across the nation increasing from 2,500 in 2003 to 3,500 in 2008, though this is significantly less than the 10,000 arcades in the early 1980s. As of 2009, a successful arcade game usually sells around 4000 to 6000 units worldwide. The relative simplicity yet solid gameplay of many of these early games has inspired a new generation of fans who can play them on mobile phones or with emulators such as MAME. Some classic arcade games are reappearing in commercial settings, such as Namco's Ms. Pac-Man/Galaga: Class of 1981 two-in-one game, or integrated directly into controller hardware (joysticks) with replaceable flash drives storing game ROMs. Arcade classics have also been reappearing as mobile games, with Pac-Man in particular selling over 30 million downloads in the United States by 2010. Arcade classics have also begun to appear on multi-game arcade machines for home users. A man playing a drumming arcade game (Drummania) in Tsukuba, Ibaraki, 2005. 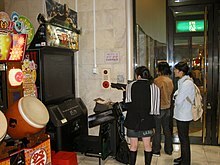 Girls playing The House of the Dead III in an amusement arcade in Japan, 2005. In the Japanese gaming industry, arcades have remained popular through to the present day. As of 2009, out of Japan's US$20 billion gaming market, US$6 billion of that amount is generated from arcades, which represent the largest sector of the Japanese video game market, followed by home console games and mobile games at US$3.5 billion and US$2 billion, respectively. In 2005, arcade ownership and operation accounted for a majority of Namco's for example. With considerable withdrawal from the arcade market from companies such as Capcom, Sega became the strongest player in the arcade market with 60% marketshare in 2006. Despite the global decline of arcades, Japanese companies hit record revenue for three consecutive years during this period. However, due to the country's economic recession, the Japanese arcade industry has also been steadily declining, from ¥702.9 billion (US$8.7 billion) in 2007 to ¥504.3 billion (US$6.2 billion) in 2010. In 2013, estimation of revenue is ¥470 billion. In the Japanese market, network and card features introduced by Virtua Fighter 4 and World Club Champion Football, and novelty cabinets such as Gundam Pod machines have caused revitalizations in arcade profitability in Japan. The reason for the continued popularity of arcades in comparison to the west, are heavy population density and an infrastructure similar to casino facilities. Former rivals in the Japanese arcade industry, Konami, Taito, Bandai Namco Entertainment and Sega, are now working together to keep the arcade industry vibrant. This is evidenced in the sharing of arcade networks, and venues having games from all major companies rather than only games from their own company. Virtually all modern arcade games (other than the very traditional Midway-type games at county fairs) make extensive use of solid state electronics, integrated circuits and Cathode Ray Tube screens. In the past, coin-operated arcade video games generally used custom per-game hardware often with multiple CPUs, highly specialized sound and graphics chips, and the latest in expensive computer graphics display technology. This allowed arcade system boards to produce more complex graphics and sound than what was then possible on video game consoles or personal computers, which is no longer the case in the 2010s. Arcade game hardware in the 2010s is often based on modified video game console hardware or high-end PC components. Arcade games frequently have more immersive and realistic game controls than either PC or console games, including specialized ambiance or control accessories: fully enclosed dynamic cabinets with force feedback controls, dedicated lightguns, rear-projection displays, reproductions of automobile or airplane cockpits, motorcycle or horse-shaped controllers, or highly dedicated controllers such as dancing mats and fishing rods. These accessories are usually what set modern video games apart from other games, as they are usually too bulky, expensive, and specialized to be used with typical home PCs and consoles. Arcade games often have short levels, simple and intuitive control schemes, and rapidly increasing difficulty. This is due to the environment of the Arcade, where the player is essentially renting the game for as long as their in-game avatar can stay alive (or until they run out of tokens). Games on consoles or PCs can be referred to as "arcade games" if they share these qualities or are direct ports of arcade titles. Many independent developers are now producing games in the arcade genre that are designed specifically for use on the Internet. These games are usually designed with Flash/Java/DHTML and run directly in web-browsers. Arcade racing games have a simplified physics engine and do not require much learning time when compared with racing simulators. Cars can turn sharply without braking or understeer, and the AI rivals are sometimes programmed so they are always near the player (rubberband effect). Arcade flight games also use simplified physics and controls in comparison to flight simulators. These are meant to have an easy learning curve, in order to preserve their action component. Increasing numbers of console flight video games, from Crimson Skies to Ace Combat and Secret Weapons Over Normandy indicate the falling of manual-heavy flight sim popularity in favor of instant arcade flight action. Other types of arcade-style games include fighting games (often played with an arcade controller), beat 'em up games (including fast-paced hack and slash games), light gun rail shooters and "bullet hell" shooters (intuitive controls and rapidly increasing difficulty), music games (particularly rhythm games), and mobile/casual games (intuitive controls and often played in short sessions). The term "arcade game" is also used to refer to an action video game that was designed to play similarly to an arcade game with frantic, addictive gameplay. The focus of arcade action games is on the user's reflexes, and the games usually feature very little puzzle-solving, complex thinking, or strategy skills. Games with complex thinking are called strategy video games or puzzle video games. Emulators such as MAME, which can be run on modern computers and a number of other devices, aim to preserve the games of the past. Emulators enable game enthusiasts to play old video games using the actual code from the 1970s or 1980s, which is translated by a modern software system. Legitimate emulated titles started to appear on the Macintosh (1994)  with Williams floppy disks, Sony PlayStation (1996) and Sega Saturn (1997), with CD-ROM compilations such as Williams Arcade's Greatest Hits and Arcade's Greatest Hits: The Atari Collection 1, and on the PlayStation 2 and GameCube with DVD-ROM titles such as Midway Arcade Treasures. Arcade games are currently being downloaded and emulated through the Nintendo Wii Virtual Console Service starting in 2009 with Gaplus, Mappy, Space Harrier, Star Force, The Tower of Druaga, Tecmo Bowl, Altered Beast and many more. Other classic arcade games such as Asteroids, Tron, Discs of Tron, Yie Ar Kung-Fu, Pac-Man, Joust, Battlezone, Dig Dug, Robotron: 2084, and Missile Command are emulated on PlayStation Network and Xbox Live Arcade. The emulators have evolved to be used in mobile phones (APPS) or websites that function as an online emulator. In addition to restaurants and video arcades, arcade games are also found in bowling alleys, college campuses, video rental shops, dormitories, laundromats, movie theaters, supermarkets, shopping malls, airports, ice rinks, corner shops, truck stops, bars/pubs, hotels, and even bakeries. In short, arcade games are popular in places open to the public where people are likely to have free time. The American Amusement Machine Association (AAMA) is a trade association established in 1981 that represents the coin-operated amusement machine industry, including 120 arcade game distributors and manufacturers. Often averaging the amount paid per game based on the length of the game play, knowing people are likely to try more than one game. For arcade games, success was usually judged by either the number of arcade hardware units sold to operators, or the amount of revenue generated, from the number of coins (such as quarters or 100 yen coins) inserted into machines, or the hardware sales (with arcade hardware prices often ranging from US$1000 to US$4000 or more). This list only includes arcade games that have either sold more than 1000 hardware units or generated a revenue of more than US$1 million. Most of the games in this list date back to the golden age of arcade video games, though some are also from before and after the golden age. These are the combined hardware sales of at least two or more arcade games that are part of the same franchise. This list only includes franchises that have sold at least 5,000 hardware units or grossed at least $10 million revenues. Chris Morris (10 May 2005). "Pac Man turns 25: A pizza dinner yields a cultural phenomenon – and millions of dollars in quarters". CNN. Archived from the original on 15 May 2011. Retrieved 23 April 2011. In the late 1990s, Twin Galaxies, which tracks video game world record scores, visited used game auctions and counted how many times the average Pac Man machine had been played. Based on those findings and the total number of machines that were manufactured, the organization said it believed the game had been played more than 10 billion times in the 20th century. Mark J. P. Wolf (2008). The video game explosion: a history from PONG to Playstation and beyond. ABC-CLIO. p. 73. ISBN 0-313-33868-X. Retrieved 10 April 2011. It would go on to become arguably the most famous video game of all time, with the arcade game alone taking in more than a billion dollars, and one study estimated that it had been played more than 10 billion times during the twentieth century. Estimated 7 billion coins (7 billion quarters / $1.75 billion) by 1982. Marlene Targ Brill (2009). America in the 1980s. Twenty-First Century Books. p. 120. ISBN 0-8225-7602-3. Retrieved 1 May 2011. $2 billion (4 billion quarters) by 1982: "Making millions, 25 cents at a time". The Fifth Estate. Canadian Broadcasting Corporation. 23 November 1982. Retrieved 30 April 2011. $600 million Japan cabinet sales in 1978: "Can Asteroids Conquer Space Invaders?" (PDF). Electronic Games. 1 (1): 30–33 . Winter 1981. Retrieved 1 February 2012. $102 million US cabinet sales by 1979. Ashcraft, Brian; Snow, Jean (2008). "sixty-five+thousand" Arcade Mania: The Turbo-charged World of Japan's Game Centers (1st ed.). Tokyo: Kodansha. ISBN 4-7700-3078-9. Retrieved 12 February 2012. Jumpman hopped over barrels, climbed ladders, and jumped from suspended platform to suspended platform as he tried to rescue a damsel from his pissed-off pet gorilla. The game was a smash, and sixty-five thousand cabinets were sold in Japan, propping up the then-struggling Nintendo and laying the groundwork for Nintendo and Donkey Kong creator Shigeru Miyamoto to dominate gaming throughout the 1980s and beyond. Bienaimé, Pierre (13 January 2012). "Square Roots: Donkey Kong (NES)". Nintendojo. Retrieved 8 April 2012. Donkey Kong sold some 67,000 arcade cabinets in two years, making two of its American distributors sudden millionaires thanks to paid commission. As a barometer of success, know that Pac-Man and Ms. Pac-Man are the only arcade games to have sold over 100,000 units in the United States. United States: 30,000 of Donkey Kong Jr. and 5000 of Donkey Kong 3. 3,211 units during April–September 2006. 830 units during April–September 2007. 3,056 units in fiscal year ending March 2007. 848 units during April–September 2007. Big Buck Hunter series sales up until April 2007: 22,500 units, including 7,500 Big Buck Hunter Pro units. Series sales after April 2007 until September 2009: additional 2,500 Big Buck Hunter Pro units and 5,500 Big Buck Safari units. 480 million player cards sold. Prices could range from ¥300 for a single card from an arcade machine to ¥1000 for a starter pack. A ¥1000 starter pack consists of 11 player cards, equivalent to ¥90.91 each. Total revenues from player card sales thus range from ¥43.64 billion (at ¥90.91 per card) to ¥144 billion (at ¥300 per card). In US dollars, this is equivalent to a range of $552.3 million to $1.82244 billion. The lowest value of $552.3 million will be assumed. ^ a b D.S. Cohen. "Killer Shark: The Undersea Horror Arcade Game from Jaws". About.com. Retrieved 3 May 2011. ^ a b "1969 Sega Duck Hunt (Arcade Flyer)". pinrepair.com. Retrieved 3 May 2011. ^ Chris Kohler (2005). Power-up: how Japanese video games gave the world an extra life. BradyGames. p. 18. ISBN 0-7440-0424-1. Retrieved 27 March 2011. ^ "Can Lasers Save VIdeo Arcades?". The Philadelphia Inquirer. 3 February 1984. Retrieved 13 March 2012. Last year, arcade game revenues were approximately $5 billion, compared to $8 billion in 1981 and $7 billion in 1982. ^ "Dave and Buster's About Page". Retrieved 20 September 2007. ^ Johnson, Tracy (3 April 1992). "Are Arcades Archaic? Business down, owners add zip and zap to lure players". The Boston Globe. p. 89. Retrieved 17 April 2012. ^ "Extentofthejam.com". Extentofthejam.com. 3 May 2013. Retrieved 8 January 2018. ^ Shanna Compton (2004). Gamers: writers, artists & programmers on the pleasures of pixels. Soft Skull Press. p. 119. ISBN 1-932360-57-3. ^ June, Laura (16 January 2013). "For Amusement Only: the life and death of the American arcade". The Verge. Retrieved 8 January 2018. ^ a b c d e f g Horwitz, Jeremy (8 July 2002). "Technology: Mortal Apathy?". The New York Times. Retrieved 4 March 2012. ^ Jay Carter (July 1993). "Insert Coin Here: Getting a Fighting Chance". Electronic Games. Retrieved 16 December 2014. ^ "Virtua Racing – Arcade (1992)". 15 Most Influential Games of All Time. GameSpot. 14 March 2001. Archived from the original on 13 December 2011. Retrieved 19 January 2014. ^ a b c "Business Week". Bloomberg Businessweek. Bloomberg (3392–3405): 58. 1994. Retrieved 25 January 2012. Hollywood's aim, of course, is to tap into the $7 billion that Americans pour into arcade games each year – and the $6 billion they spend on home versions for Nintendo and Sega game machines. Combined, it is a market nearly 2 ½ times the size of the $5 billion movie box office. ^ a b c "CPI Inflation Calculator". Bureau of Labor Statistics. Retrieved 22 February 2012. ^ Mark Stephen Pierce (1998). "Coin-Op: The Life (Arcade Videogames)" (PDF). Digital illusion: entertaining the future with high technology (PDF). ACM Press. p. 444. ISBN 0-201-84780-9. Archived from the original (PDF) on 23 July 2011. Retrieved 2 May 2011. ^ "News: Virtua Fighter 3". Computer and Video Games (174): 10–1. May 1996. ^ THG.RU (1 January 2000). "Second Hand Smoke - One up, two down". THG.RU. Retrieved 8 January 2018. ^ Henry, Lydia (26 April 2001). "Skee-ball Mania". Reading Eagle. p. 36. Retrieved 13 March 2012. ^ "Video killed the arcade star". East Valley Tribune. 20 April 2006. Retrieved 7 March 2012. ^ Webb, Marcus (September 1996). "Arcade Games Down 40% in Five Years". Next Generation. No. 21. Imagine Media. p. 22. ^ Mabry, Donald J. "Evolution of Online Games". Archived from the original on 9 February 2008. Retrieved 21 September 2007. ^ Fuller, Brad. "Awakening the Arcade". Archived from the original on 3 October 2011. Retrieved 21 September 2007. ^ "In the Studio". Next Generation. No. 27. Imagine Media. March 1997. p. 24. ^ "Bullwinkles Family Fun Center". Archived from the original on 11 September 2007. Retrieved 20 September 2007. ^ "Gatti's Pizza: About Us". Archived from the original on 24 September 2009. Retrieved 20 September 2007. ^ Chou, Yuntsai (Fall 2003). "G-commerce in East Asia: Evidence and Prospects". Journal of Interactive Advertising. 4 (1). Archived from the original on 2 December 2008. Retrieved 31 January 2012. ^ Jou, Eric (19 March 2012). "The Wonderful and Seedy World of Chinese Arcades". Kotaku. Archived from the original on 22 March 2012. Retrieved 9 April 2012. ^ Nigel K. Li Pope; Kerri-Ann L. Kuhn; John J.H. Forster, eds. (2009). Digital sport for performance enhancement and competitive evolution : intelligent gaming technologies. Hershey, PA: Information Science Reference. p. 260. ISBN 1-60566-406-5. Retrieved 14 March 2012. ^ "Ms. Pac-Man/Galaga — Class Of 1981". KLOV. Retrieved 10 September 2006. ^ "Arcade Machines of the highest quality". Bespoke Arcades. Retrieved 25 June 2013. ^ Sambe, Yukiharu (2009). "Japan's Arcade Games and Their Technology". Lecture Notes in Computer Science. Entertainment Computing– ICEC 2009. 5709: 338. doi:10.1007/978-3-642-04052-8_62. Retrieved 25 January 2012. ^ Carless, Simon (2 May 2005). "Namco, Bandai To Merge". Gamasutra. Retrieved 13 March 2012. ^ "Video Games Daily | Yu Suzuki: The Kikizo Interview (Page 2)". archive.videogamesdaily.com. Retrieved 28 June 2015. ^ https://www.segasammy.co.jp/english/ir/library/pdf/printing_annual/2008/e_2008_annual.pdf Page 16: " The domestic market has continued to expand for five years and has set new records for three consecutive years." ^ a b "Market Data". Capcom Investor Relations. 14 October 2011. Retrieved 14 April 2012. ^ Russell, Danny. "Interview: Takenobu Mitsuyoshi". TSSZ News. Retrieved 28 June 2015. ^ Butts, Steve (2003). "Secret Weapon Over Normandy Review". IGN. Archived from the original on 14 February 2007. Retrieved 15 August 2007. ^ "Genre Definitions". Mobygames. Retrieved 7 October 2014. ^ "Joust for Macintosh (1994) - MobyGames". MobyGames. Retrieved 10 December 2017. ^ "Digital Eclipse Software, Inc. - MobyGames". MobyGames. Retrieved 10 December 2017. ^ "American Amusement Machine Association". www.gamingregulation.com. Retrieved 10 December 2017. ^ "AAMA mission statement". AAMA. 2016. Retrieved 26 January 2017. ^ Kushner, David (23 September 1999). "Care for a Latte With That, Mr. Nukem?". The New York Times. ISSN 0362-4331. Retrieved 10 December 2017. ^ Mark J. P. Wolf (2008). The video game explosion: a history from PONG to Playstation and beyond. ABC-CLIO. p. 275. ISBN 0-313-33868-X. Retrieved 10 April 2011. What are the best-selling video games? There are a number of factors to consider when attempting to answer this question. First, there are several different types of video games, which makes comparisons difficult, or perhaps unfair. Arcade games are played for a quarter a play (although some are 50 cents, or even more), while home games are bought outright, and their systems must be purchased as well. ^ a b c Kao, John J. (1989). Entrepreneurship, creativity & organization: text, cases & readings. Englewood Cliffs, NJ: Prentice Hall. p. 45. ISBN 0-13-283011-6. Retrieved 12 February 2012. Estimates counted 7 billion coins that by 1982 had been inserted into some 400,000 Pac Man machines worldwide, equal to one game of Pac Man for every person on earth. US domestic revenues from games and licensing of the Pac Man image for T-shirts, pop songs, to wastepaper baskets, etc. exceeded $1 billion. ^ a b c top-10-biggest-grossing-arcade-games-of-all-time. 2013. p. 228. ISBN 0-7619-2976-2. Retrieved 23 April 2011. Due to the relative ease of making illegal versions of Capcom's CP System boards, many pirated copies of the arcade game also existed, which would likely boost its revenue number considerably. But for obvious reasons, the actual sum will never be known. Jiji Gaho Sha, inc. (2003). "Asia Pacific perspectives, Japan". University of Virginia. p. 57. Retrieved 9 April 2011. At that time, a game for use in entertainment arcades was considered a hit if it sold 1000 units; sales of Space Invaders topped 300,000 units in Japan and 60,000 units overseas. Dale Peterson (1983). Genesis II, creation and recreation with computers. Reston Publishing. p. 175. ISBN 0-8359-2434-3. Retrieved 1 May 2011. By 1980, some 300,000 Space Invader video arcade games were in use in Japan, and an additional 60,000 in the United States. Kohler, Chris (2004). Power-Up: How Japanese Video Games Gave the World an Extra Life. Indianapolis, Ind. : BradyGames. p. "represented+a+significant+portion+of+the+cost" 19. ISBN 0-7440-0424-1. Within one year of its US release, an additional 60,000 machines had been sold. One arcade owner said of Space Invaders that it was the first arcade game whose intake "represented a significant portion of the cost of [buying] the game in any one week." That is, it was the first video game that paid for itself within about a month. ^ Ste Curran (2004). Game plan: great designs that changed the face of computer gaming. Rotovision. p. 38. ISBN 2-88046-696-2. Retrieved 11 April 2011. When Street Fighter II′ (pronounced street fighter two dash) was released just a short time later, it sold around 140,000 units, at ¥160.000 (c. US $1300 / £820) each. The figures were beyond massive – they were simply unheard of. Capcom's Titanic wasn't sinking. Anything but. The game was a runaway success in its territory of choice, bringing Western gamers as much joy as it had in the East. ^ Steven L. Kent (2001). "The Ultimate History of Video Games: The Story behind the Craze that Touched Our Lives and Changed the World". Prima. p. 446. Retrieved 9 April 2011. Capcom will not release the final numbers, but some outsiders have estimated that more than 60,000 Street Fighter II arcade machines were sold worldwide. ^ a b c Steven L. Kent (2001). "The Ultimate History of Video Games: The Story behind the Craze that Touched Our Lives and Changed the World". Prima. p. 352. Retrieved 9 April 2011. With more than 60,000 units sold in the United States, Donkey Kong was Nintendo's biggest arcade hit. The arcade industry began its long collapse the year after Donkey Kong was released, and Nintendo's arcade fortunes eroded quickly. Nintendo released Donkey Kong Junior in 1982 and sold only 30,000 machines, 20,000 Popeye machines (also 1982), and a mere 5000 copies of Donkey Kong 3 (1983). ^ a b c Jörg Ziesak (2009). Wii Innovate – How Nintendo Created a New Market Through the Strategic Innovation Wii. GRIN Verlag. p. 50. ISBN 3640497740. Retrieved 9 April 2011. Donkey Kong was Nintendo's first international smash hit and the main reason behind the company's breakthrough in the Northern American market. In the first year of its publication, it earned Nintendo 180 million US dollars, continuing with a return of 100 million dollars in the second year. ^ a b "Bally Will Quit Making Pinball, Video Machines". Toledo Blade. 11 July 1988. p. 22. Retrieved 9 March 2012. ^ a b Mark J. P. Wolf (2001). The medium of the video game. University of Texas Press. p. 44. ISBN 0-292-79150-X. Retrieved 9 April 2011. ^ a b Steve L. Kent (2001). The ultimate history of video games: from Pong to Pokémon and beyond : the story behind the craze that touched our lives and changed the world. Prima. p. 132. ISBN 0-7615-3643-4. Atari sold more than 70,000 Asteroids machines in the United States. The game did not do as well in Europe and Asia, however. Only about 30,000 units were sold overseas. ^ a b Gottschalk, S. (1995). "Videology: Video-Games as Postmodern Sites/Sights of Ideological Reproduction". Symbolic Interaction. 18 (1). Retrieved 26 February 2012. ^ "Forbes, Volume 127". Forbes: 102. 1981. Retrieved 25 February 2012. At $2000 a unit, Atari has made about $140 million from that game alone. ^ a b Sellers, John (2001). Arcade fever: the fan's guide to the golden age of video games. Philadelphia: Running Press. p. 51. ISBN 0-7624-0937-1. Retrieved 25 February 2012. Williams sold around 60,000 units of Defender, easily the company's most successful game. ^ Steven L. Kent (2001). "The Ultimate History of Video Games: The Story behind the Craze that Touched Our Lives and Changed the World". Prima. p. 147. Retrieved 9 April 2011. Defender was Williams Electronics' biggest seller. More than 55,000 units were placed worldwide. ^ a b Morrison, Michael (2002). Sams teach yourself game programming in 24 hours (1. printing. ed.). Indianapolis, IN: Sams Publishing. p. 2. ISBN 0-672-32461-X. Retrieved 23 February 2012. ^ Mark J. P. Wolf. The video game explosion: a history from PONG to Playstation and beyond. ABC-CLIO. p. 104. ISBN 0-313-33868-X. Retrieved 19 April 2011. ^ a b "MIDWAY MFG. CO. v. ARTIC INTERN". 10 March 1982. Archived from the original on 15 May 2012. Retrieved 6 March 2012. Brian Ashcraft; with Jean Snow; forewords by Kevin Williams; Crecente, Brian (2008). "sixty-five+thousand" Arcade Mania: The Turbo-charged World of Japan's Game Centers (1st ed.). Tokyo: Kodansha. ISBN 4-7700-3078-9. Retrieved 12 February 2012. Jumpman hopped over barrels, climbed ladders, and jumped from suspended platform to suspended platform as he tried to rescue a damsel from his pissed-off pet gorilla. The game was a smash, and sixty-five thousand cabinets were sold in Japan, propping up the then-struggling Nintendo and laying the groundwork for Nintendo and Donkey Kong creator Shigeru Miyamoto to dominate gaming throughout the 1980s and beyond. ^ a b Steve L. Kent (2001). The ultimate history of video games: from Pong to Pokémon and beyond : the story behind the craze that touched our lives and changed the world. Prima. p. 352. ISBN 0-7615-3643-4. In 1982, Universal Sales made arcade history with a game called Mr Do! Instead of selling dedicated Mr Do! machines, Universal sold the game as a kit. The kit came with a customized control panel, a computer board with Mr Do! read-only memory (ROM) chips, stickers that could be placed on the side of stand-up arcade machines for art, and a plastic marquee. It was the first game ever sold as a conversion only. According to former Universal Sales western regional sales manager Joe Morici, the company sold approximately 30,000 copies of the game in the United States alone. ^ Out Run: ZX Spectrum Instructions. U.S. Gold. 1987. Retrieved 23 February 2012. ^ a b "Pump It Up: Exceed drops to PS2 / Xbox". Punch Jump Crew. 8 September 2005. ^ "The Huffington Post". The Huffington Post. 26 September 2013. Retrieved 8 January 2018. ^ "Computerandvideogames.com". Computerandvideogames.com. Retrieved 8 January 2018. ^ a b Steven L. Kent (2001). "The Ultimate History of Video Games: The Story behind the Craze that Touched Our Lives and Changed the World". Prima. p. 91. Retrieved 9 April 2011. According to Kauffman, Exidy sold only 1,000 Death Race machines, just a fraction of the number of Sea Wolf and Gun Fight machines Midway placed that same year, but Death Race stirred up protests and was even discussed on CBS's 60 Minutes. ^ a b c d e f "FY Ending March 2006: Full Year Results Presentation" (PDF). Sega Sammy Holdings. 16 May 2006. p. 11. Retrieved 17 May 2012. ^ a b "Motorcycle game to Atari". NewsBytes. 1 October 1985. Archived from the original on 5 January 2009. Retrieved 7 March 2012. So far, Sega has shipped approx. 7,000 Hang-ons to the Japanese and overseas market. ATARI IRELAND gets 500 sets for the initial shipment, a report says. ^ a b c d e f "FY 2007: Interim Results (April-September 2006)" (PDF). Sega Sammy Holdings. 10 November 2006. pp. 11–13. Retrieved 18 May 2012. ^ Keith Smith (30 August 2012). "Allincolorforaquarter.blogspot.co.uk". Allincolorforaquarter.blogspot.co.uk. Retrieved 8 January 2018. ^ a b c d e f "FY2004 Financial Results (for the year ended March 31, 2005)" (PDF). Tokyo: Sega Sammy Holdings. 25 May 2005. p. 11. Retrieved 17 May 2012. ^ a b "FY2005 1Q Results: Amusement Machine Sales" (PDF). FY2005 1Q Business Results (April–June 2005). Sega Sammy Holdings. 4 August 2005. p. 6. Retrieved 18 May 2012. ^ a b c d "Fiscal Year 2008: Interim Results" (PDF). Sega Sammy Holdings. 12 November 2007. p. 11. Retrieved 19 May 2012. ^ a b "Fiscal Year Ended March 2007: Full Year Results" (PDF). Sega Sammy Holdings. 14 May 2007. p. 11. Retrieved 17 May 2012. ^ a b c d e f g h i j k Fujihara, Mary (2 November 1983). "Inter Office Memo". Atari. Retrieved 18 March 2012. ^ a b c d e f g h Fujihara, Mary (25 July 1983). "Inter Office Memo". Atari. Retrieved 18 March 2012. ^ a b "First Half Business Results (April–September 2004)" (PDF). Sega Sammy Holdings. 11 November 2004. p. 4. Retrieved 17 May 2012. ^ "Segment Results: Amusement Machines" (PDF). FY 2007: 1st Quarter Results (April–June 2006). Sega Sammy Holdings. 28 July 2006. p. 10. Retrieved 18 May 2012. ^ a b "AOU 2009 - Sega World Club Champion Football Intercontinental Clubs 2007-2008". AOU Amusement Expo 2009. DigInfo TV. 2 March 2009. Archived from the original on 23 August 2012. Retrieved 18 May 2012. ^ a b "Sports Gaming in Japan: World Club Champion Football". GameSpot. 22 September 2009. Archived from the original on 3 February 2013. Retrieved 18 May 2012. ^ a b c d e f g h i j k l m n o p q r s t u v w x "Currency Conversion". XE.com. Retrieved 13 April 2012. ^ a b c d "Stern Production Numbers and More CCI Photos". 1 May 2012. Retrieved 21 July 2013. ^ a b "FY Ending March 2006: Interim Results Presentation (April–September 2005)" (PDF). Sega Sammy Holdings. 22 November 2005. Retrieved 17 May 2012. ^ a b c d Carless, Simon (29 March 2007). "Uemura – Sega's Hidden Game Design Power?". GameSetWatch. Retrieved 17 May 2012. ^ a b c d Ashcraft, Brian (14 October 2005). "How Sega Reels in Girls". Kotaku. Retrieved 17 May 2012. ^ a b "FY2005 Third quarter Financial Results (April–December 2004)" (PDF). Konami. 27 January 2005. p. 15. Archived from the original (PDF) on 16 January 2006. Retrieved 20 April 2012. ^ a b c "Fiscal Year Ending March 2007: 3rd Quarter Results (April-December 2006)" (PDF). Sega Sammy Holdings. 7 February 2007. pp. 11–13. Retrieved 19 May 2012. ^ "Fiscal Year Ending March 2006: 3rd quarter Results (April–December 2005)" (PDF). Sega Sammy Holdings. 8 February 2006. p. 8. Retrieved 17 May 2012. ^ a b c d e f g h i j k l m n o p q r s t u v w x y z aa ab ac ad ae af ag ah ai aj ak al am an ao ap aq ar as at au av aw ax ay az ba bb bc bd be bf bg bh bi bj bk bl bm bn bo bp bq br bs bt bu bv "Atari Production Numbers Memo". Atari Games. 4 January 2010. Archived from the original on 20 January 2013. Retrieved 18 March 2012. ^ a b c d e "Appendix of Consolidated Financial Statements: 9 Months Ended December 31, 2009" (PDF). Sega Sammy Holdings. 5 February 2010. p. 3. Retrieved 13 April 2012. ^ a b c "Segment Results: Amusement Machine" (PDF). Fiscal Year 2009: Full Year Results (Ending March 2009). Sega Sammy Holdings. 14 May 2009. p. 15. Retrieved 19 May 2012. ^ a b c d e f g h i "Appendix of Consolidated Financial Statements: Year Ended March 31, 2010" (PDF). Sega Sammy Holdings. 14 May 2010. p. 3. Retrieved 13 April 2012. ^ a b c d e f g h i j "Appendix of Consolidated Financial Statements: Year Ended March 31, 2011" (PDF). Sega Sammy Holdings. 13 May 2011. p. 3. Retrieved 13 April 2012. ^ a b c d e f g h i "Appendix of Consolidated Financial Statements: Year Ended March 31, 2012" (PDF). Sega Sammy Holdings. 11 May 2012. p. 3. Retrieved 17 May 2012. ^ a b "Appendix of Consolidated Financial Statements: 9 Months Ended December 31, 2011" (PDF). Sega Sammy Holdings. 3 February 2012. p. 3. Retrieved 13 April 2012. ^ a b c d e f "FY Ending March 2013: 1st Quarter Results Presentation (Ended June 2012)" (PDF). Sega Sammy Holdings. 1 August 2012. p. 11. Retrieved 2 September 2012. ^ a b Steve L. Kent (2001). The ultimate history of video games: from Pong to Pokémon and beyond : the story behind the craze that touched our lives and changed the world. Prima. p. 225. ISBN 0-7615-3643-4. Cinematronics sold more than 16,000 Dragon's Lair machines in 1983, for an average price of $4300. Coleco purchased the home rights to the game, giving Cinematronics an additional $2 million. ^ Harmetz, Aljean (13 August 1983). "Daring Dirk Perk For Arcades". Ottawa Citizen. p. 29. Retrieved 28 February 2012. ^ a b c "Rick Dyer: Biography". Allgame. Retrieved 10 April 2011. ^ "VIDEO ARCADES: HANGOUT CHOICE OF A NEW GENERATION". DeseretNews.com. 12 April 1994. Retrieved 10 December 2017. ^ a b "Appendix of Consolidated Financial Statements 6 Months Ended September 30, 2011" (PDF). Sega Sammy Holdings. 31 October 2011. p. 3. Retrieved 13 April 2012. ^ Smith, Keith (22 November 2013). "The Golden Age Arcade Historian: Video Game Firsts??". Allincolorforaquarter.blogspot.co.uk. Retrieved 8 January 2018. ^ "Amusement Machine: 3Q Principle Titles" (PDF). Fiscal Year Ending March 2006: 3rd Quarter Appendix (April–December 2005). Sega Sammy Holdings. 8 February 2006. p. 4. Retrieved 18 May 2012. ^ Harmetz, Aljean (3 July 1982). "Movie Themes Come To Video Games". Star-News. Retrieved 28 February 2012. ^ Jack B. Rochester; John Gantz (1983). The naked computer: a layperson's almanac of computer lore, wizardry, personalities, memorabilia, world records, mind blowers, and tomfoolery. William Morrow and Company. p. 164. ISBN 0-688-02450-5. Retrieved 20 April 2011. Although the Disney Studios expected to make over $400 million from this siliconic extravaganza, our source at Variety tells us that its North American rentals were $15 million and estimated total gross, $30 million. The arcade game Tron, made by Bally, grossed more. ^ "Outline of Results Briefing" (PDF). Square Enix. 23 May 2008. p. 4. Retrieved 18 May 2012. ^ a b "Outline of Results Briefing by SQUARE ENIX HOLDINGS held on November 7, 2008" (PDF). Square-Enix.com. Retrieved 20 December 2008. ^ a b c d "Segment Results: Amusement Machines" (PDF). FY 2008: Full Year Results (Ending March 2008). Sega Sammy Holdings. 15 May 2008. p. 13. Retrieved 19 May 2012. ^ Steve L. Kent (2001). The ultimate history of video games: from Pong to Pokémon and beyond : the story behind the craze that touched our lives and changed the world. Prima. p. 224. ISBN 0-7615-3643-4. Gottlieb sold approximately 25,000 Q*Bert arcade machines. ^ a b "Japanese gamers shake it, shake it!". South Africa: Independent Online (South Africa). 14 August 2000. Retrieved 19 April 2012. ^ a b c d e f g h i j k l m n o p q r s t u v w x y z aa ab ac "Production Numbers" (PDF). Atari. 1999. Retrieved 19 March 2012. ^ Fulton, Jeff (2010). "A short history of Missile Command". The essential guide to Flash games : building interactive entertainment with ActionScript 3.0 (New ed.). [Berkeley, Calif.]: Friends of ED. p. 138. ISBN 1-4302-2614-5. Retrieved 7 February 2012. While certainly not the size of Asteroids, the game was still a huge hit with almost 20,000 units sold. ^ a b "Business 1974: Industry: Space Age Pinball, Atari's PONG". Time. 5 October 1983. Retrieved 21 April 2011. Typical of the new games is Pong, a popular version of electronic table tennis manufactured by two-year-old Atari, Inc. (estimated fiscal 1974 revenue: $14 million) of Los Gatos, Calif. Atari sold some 8,500 games to U.S. amusement parlors and other businesses last year. ^ a b Ashley S. Lipson; Robert D. Brain (2009). Computer and Video Game Law: Cases and Materials. Carolina Academic Press. p. 9. ISBN 1-59460-488-6. Retrieved 11 April 2011. Atari eventually sold more than 19,000 Pong machines, giving rise to many imitations. Pong made its first appearance in 1972 at "Andy Capp's," a small bar in Sunnyvale, California, where the video game was literally "overplayed" as eager customers tried to cram quarters into an already heavily overloaded coin slot. ^ a b Barack, Lauren (8 May 2003). "In Blast From the Past, Atari Video Games Plan a Return". New York Post. p. 34. Retrieved 28 February 2012. Its first hit game, "Pong," launched in 1972, made $11 million in revenue in just one year. ^ a b Strang, Katie (24 April 2007). "Shootout at the local pub: Big Buck Hunter is a hit". The Arizona Republic. Retrieved 18 March 2012. ^ "Entering The Snakepit – A Winner". NewsBytes. 20 December 1983. Archived from the original on 25 February 2009. Retrieved 7 March 2012. ^ a b Shaggy (7 January 2010). "Big Buck Hunter Open Season pushes 3000 units in 90 days". Arcade Heroes. Retrieved 16 June 2012. ^ Shaggy (11 February 2010). "Silver Strike LIVE starts shipping next week". Arcade Heroes. Retrieved 16 June 2012. ^ "Operator bowled over by H2Overdrive". Namco Bandai Games. 5 March 2010. Archived from the original on 25 May 2013. Retrieved 16 June 2012. ^ a b Beals, Gregory (11 December 2000). "Kings of Cool". Newsweek. Retrieved 19 April 2012. Konami has sold 25,000 Beatmania machines in three years. In the arcade industry, selling 1000 units is considered a success. ^ a b Steven L. Kent (2000). The first quarter: a 25-year history of video games. BWD Press. p. 83. ISBN 0-9704755-0-0. Retrieved 9 April 2011. Sea Wolf, which was another creation of Dave Nutting, did solid business, selling more than 10,000 machines. ^ Orland, Kyle (4 March 2011). "GDC 2011: Mark Cerny Discusses Marble Madness' Turbulent Development". Gamasutra. Archived from the original on 20 March 2011. Retrieved 8 March 2011. ^ Steven L. Kent (2000). The first quarter: a 25-year history of video games. BWD Press. p. 83. ISBN 0-9704755-0-0. Retrieved 9 April 2011. ^ a b Shaggy (3 May 2010). "Initial sales numbers for Terminator Salvation arcade". Arcade Heroes. Retrieved 16 June 2012. ^ Shaggy (10 June 2009). "Betson: 2000 Guitar Hero units have been sold in three months". Arcade Heroes. Retrieved 16 June 2012. ^ Buchanan, Levi (28 August 2008). The Revolution of I, Robot, IGN. ^ "Atari: From Starting Block To Auction Block". InfoWorld. InfoWorld Media Group. 6 (32): 52. 6 August 1984. ISSN 0199-6649. Retrieved 5 March 2012. ^ Modine, Austin (13 December 2008). "Before Pong, there was Computer Space". The Register. Retrieved 23 February 2012. ^ "Call-it Entertainment, Inc. Partners with Capcom to Launch Street Fighter Wireless Game Series". Business Wire. 16 May 2002. Archived from the original on 24 June 2002. Retrieved 17 April 2012. ^ Guinness World Records Gamer's Edition 2008. Guinness World Records Gamer's Edition. Guinness World Records. 2008. p. 77. ISBN 1-904994-21-0. Retrieved 9 April 2011. Street Fighter has sold over 25 million console games and 500,000 arcade units generating more than a billion dollars in revenue. ^ Leonard Herman; Jer Horwitz; Steve Kent; Skyler Miller (2002). "The History of Video Games" (PDF). GameSpot. p. 7. Archived from the original (PDF) on 25 April 2012. Retrieved 14 March 2012. ^ "What is Golden Tee?". Incredible Technologies. Archived from the original on 11 January 2013. ^ Sickinger, Ted (6 November 1995). "The year of Mortal Kombat". The Kansas City Star. p. 1. Retrieved 4 March 2012. More than 1 billion quarters have dropped through its slots since 1992. The first two home versions sold more than 10 million copies at $50 and $60 apiece. Wikimedia Commons has media related to Arcade games.